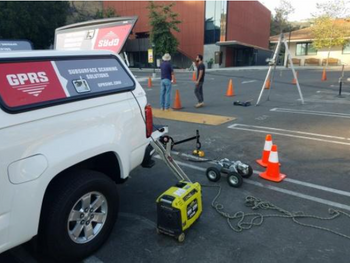 GPRS was contacted by a local contractor in Southern California that had a problem that needed solving. 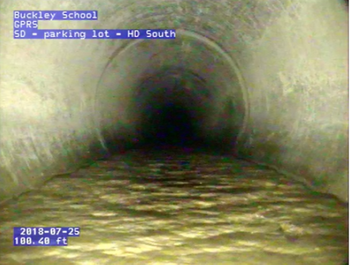 They had a project at the Buckley School in Sherman Oaks, and they needed to determine where the main storm sewer line was running along with the location of any taps in the work area(s). This might seem like a pretty simple project, however, the storm sewer pipe is a 51 inch RCP (Reinforced Concrete Pipe) and it is roughly 20-25 feet deep. Our GPRS operator first had to outfit the crawler camera onto the large diameter carriage for larger diameter pipes. This proved necessary due to the rough terrain on the bottom of the pipe, which wouldn’t have been surveyable with any standard style wheels. 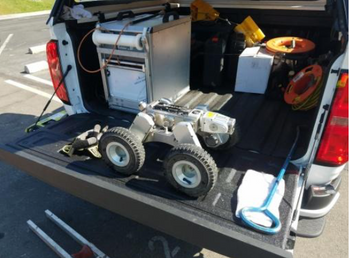 Along with outfitting the CCTV crawler camera with the wheel carriage, the operator also had to secure a powerful battery operated sonde to the camera to allow it to be located. The crawler camera does come equipped with a built in sonde, but it is limited in depth capability due to its frequency. The battery powered sonde attached to the crawler operates at 33KHz, and has the ability of locating lines up to 30 Ft deep. With the equipment all set up, we are now able to access the pipe and complete the survey. On this project however, we wanted to take extra safety precautions since we were working on a school. With a safety manager from the contractor on site we set up a fall arrest tripod over the manhole and the GPRS operator was fitted into a fall protection harness. We also had a spotter on site, and a safety plan in place in case of any possibly incidents. Now with all safety measurement in place, we were able to remove the manhole lid with the use of a magnetic lid lifter, and lower the inline crawler camera into the 51 inch storm pipe. Driving the camera upstream approximately 85 ft to the work area was a bumpy ride due to some solidified sediment on the bottom of the pipe. The sediment did not restrict water or present any damage, but it did make for an “offroad” venture for the camera on its journey. GPRS operator was able to identify a single tap coming off the 10 O’clock side of the pipe in the work area. Now that the tap has been seen on the screen, we next needed to locate that above ground. With the high powered 33KHz sonde attached to the camera, GPRS was at least able to locate the camera’s position along the pipeline. Due to the depth, and the need to be extremely accurate, the operator decided to use a triangulation method of locating the sonde attached to the crawler cam. Triangulating a sonde is always the most accurate way of locating both the two dimensional location above ground and also the depth of the sonde in the pipe. As mentioned earlier, a sonde emits a radioe frequency which allows the operator to locate its location. The radio frequency field emitted by the sonde looks like a giant sphere (if you could see it that is). This frequency field will present a 4 point pattern of “nulls” above ground, that create a “X marks the spot” location. The four null indicate the front/back of the sonde, and both sides. The GPRS operator was able to accurately triangulate and locate the location of the camera along the pipe and the location of the tap in the work area.